Did you wake up this morning with a deep, dark cloud of post-Thanksgiving sads hanging over your head? Did you feel just a smidge...out of sorts? Maybe a little bit zany? Like you might be losing your grip on reality for reasons not entirely within your control? Don’t worry, the White House is here to remind you that there’s still something worth living for: Christmas!!!! For the most part, this all seems fine and normal enough, until you see the long line of FULLY DRENCHED BLOOD EVERGREENS—40 in all—flanking the East Wing hallway. This is the second year in a row that the Trump administration has taken a decidedly weird approach to Christmas decorating, though it should be said that I think we all prefer the 2018 goth look over 2017's truly haunting pure white aesthetic. Still, we must ask: What the hell is happening here??? 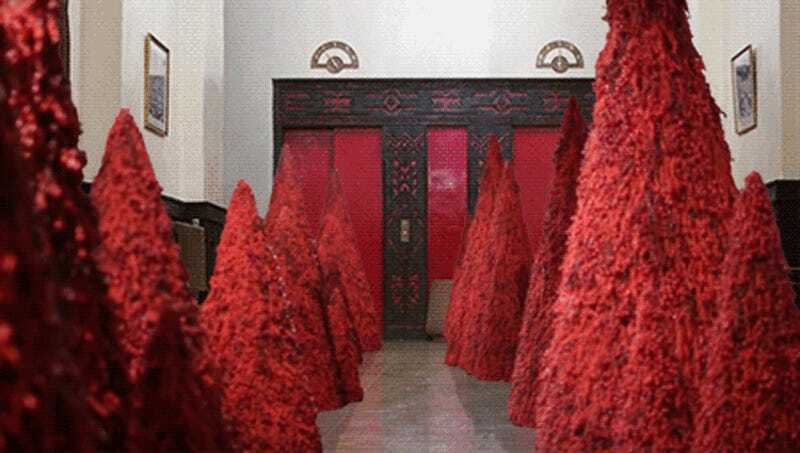 The trees look like conical extractions from a human lung, or a tasteful museum display of fresh animal carcasses roasting on spits, or the blood-stained pelts Gritty’s species draped over coat racks to dry, or a nod to the dystopia of The Handmaid’s Tale, or even the First Lady’s artistic interpretation of painting the roses red. What they do not look like, however, is a cheerful, warm, or whimsical way to greet the holiday season with decoration. So maybe the First Lady—and the White House staff in charge of the annual decorations—was also feeling a little weird this week. Maybe the effects of being isolated in an Overlook Hotel of our making have started to seep into what were once pure expressions of joy and anticipation. Maybe our visions of the future have become too disturbing to ignore. Maybe the mania has started to fully take over. Maybe we’ll never escape. But we can still have some fun, can’t we?!!! Hell yeah, after all, all work and no play makes Jack a dull boy. Merry Christmas, psychos.